Save an additional 5% off Goska's Liquors standard 10% mixed case discounting when you purchase twelve 750ml bottles of wine. Items already on sale will not receive additional discounting but will count toward your mixed case purchase. Must present coupon at time of purchase to receive offer. Customer responsible for any sales tax. One coupon per person per visit at Goska's Liquors. Offer valid while supplies last. Coupon valid from April 4 through May 1, 2019. Must be 21 years of age or older with valid identification to use coupon. Must present coupon at time of purchase to receive offer. Customer responsible for any sales tax. One coupon per person per visit at Goska's Liquors. Offer valid while supplies last. Coupon valid from April 4 through May 1, 2019. Must be 21 years of age or older with valid identification to use coupon. 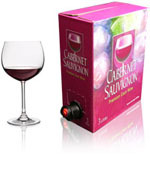 10% OFF Boxed Wine Purchase.